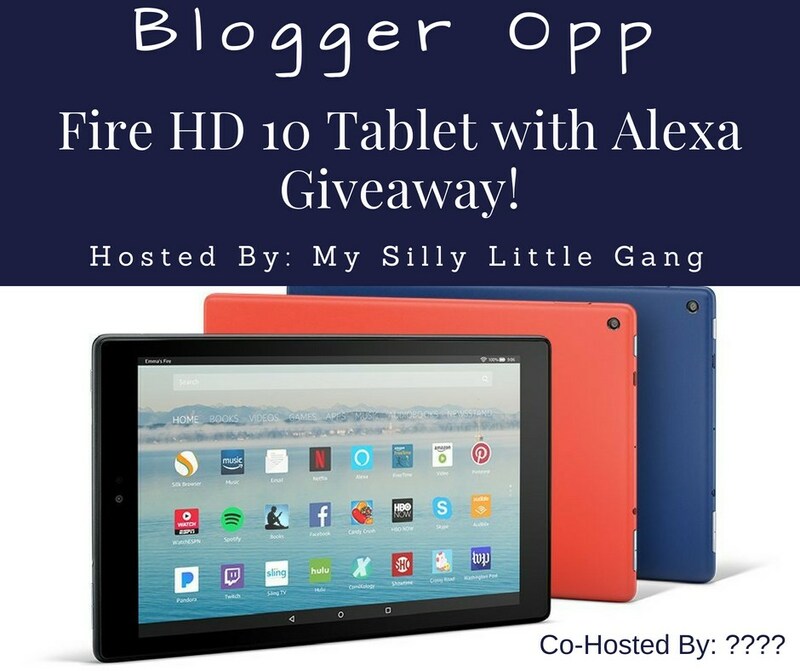 Fire HD 10 Tablet with Alexa Giveaway Blogger Opp! My Silly Little Gang is hosting a giveaway for 1 lucky winner to receive a Fire HD 10 Tablet with Alexa in winner’s choice of Black, Red or Blue! Please Sign Up now to help her promote this fabulous giveaway! Co-Hosts Wanted & Needed ~ $15 for 5 links of your choice (and any links other than Google+). You can do Facebook Comments, Blog Comments, Giveaway Entries, Daily Votes, Social Media Follows of your choice, Secret Word Pages ANYTHING! PLUS the 2 FREE links above gives you 7 Links Total! Co-Hosts will receive a backlink to their site PLUS Daily Entry Options That Will Encourage Daily Website Visits Whenever Possible. Co-Hosts are not required to post announcement but it is greatly appreciated!